My current vehicle is a 2006 mitsubishi outlander, but the transmission is failing at 200,000 miles so it is likely time to buy used again. If it will cost a couple grand to fix I might as welluse those $$ for a downpayment I think. My outlander has been a great vehicle, but the dealership has gone downhill, so time for a change. The reviews I have read about 2014 to 2016 Kia Souls have been good, and I do like the funky look of them. The Santa Fe reviews seem good but I dont know a whole lot about them. Kia and Hyundai share the same engineering team in South Korea so their reliablity is abou the same. It ranges from average to above average on all their cars. They are solid cars that last a long time. I would test drive the cars you are considering as they are both pretty safe bets in regards to reliablity, decent fuel economy, and if that is what you need in cargo capacity it will work. I only know about the Santa Fe in the snow and the AWD version is capable. Not the best AWD system but good enough for the snow. Best of luck in your hunt for the car you want. If you narrow down a coupleasure of choices then shop prices. 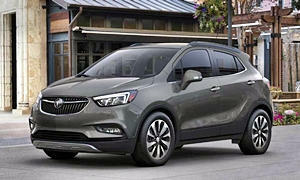 You can get a Buick Encore AWD for $16,000 with a 4 years, 50,000 mile warranty and it has been one of thr .oat reliable near-luxury vehicles in its class. New 2018 Buick Encore Preferred for sale at Robert Brogden Buick GMC in Olathe, KS for $16,807. View now on Cars.com. Actually, I think Kia remains a semi-autonomous company with its own engineers, manufacturing plants, and so forth. Hyundai owns Kia, and they are integrated at the very highest level of the company, but they are not as integrated as today's GM, Ford, etc. They're more like GM was in the 1950s-1960s before they began to fully integrate their operations. Sounds like you certainly got your money's worth out of your Mitsu! Both the Soul and Sante Fe are competent, reliable cars that would do a great job carting you and your Greyhounds around. But I'm wondering why you are comparing the Soul to the Sante Fe as it is a much bigger, more expensive car than the Soul. Have you considered the Hyundai Tucson which is closer to the Soul size and price wise? Unless you have something against the Tucson, you should definitely add that to your list. While don't have any seat time in the Sante Fe or Tucson, I have driven Souls 4 different times as a rental during trips and find them to be a very pleasant car. As you probably already know both are very different vehicles so let's look at some of the differences. The biggest differences are size and the availablity of AWD in the Sante Fe (also available in FWD only configuration). 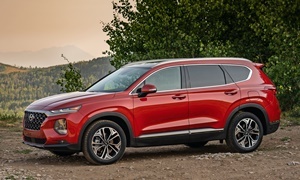 Also the Sante Fe will be significantly more expenses both in terms of initial purchase price (around 40%-60% depending on year and model) and to operate due higher gas consumption. I assume any of the above three will work for you size-wise, but you might want to see which one has more height in the hatch area for you long legged greyhounds. 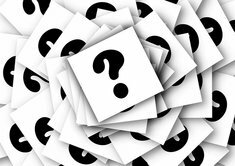 Since you live in a snowbelt area perhaps the major factor is do you need AWD? If your trips to town and visits to your daughter involve mountain passes and you are likely to travel during major snowfall times, I definitely think you should go for an AWD rig. On the other hand, if you don't have drive during storms and don't live in an area with steep side street hills or have a steep driveway, the Soul's FWD and traction control system, along with a good set of winter tires, should serve your purposes well. I would recomend the 2nd generation Soul (2014 or newer) as it is more refined and the ride is smoother. Give your Greyhounds a pat for me (retired veterinarian)! I think this article you will find interesting that was done a number of years ago by Forbes - it is where I discovered they share the same engineering team and actually a number of platforms (not all). Kia and Hyundai are separate car companies, but they do share the same engineers. Why the Stinger is very much like the Genesis G80 - they are not the same car, but they share the same powertrain and platform. They do not share much of anything else. Hyundai back in 1998 owned 51% of Kia, but it declined to 33% back in 2013. Also, Kia owns percentages in 22 Hyundai companies. They are definately separate car companies but they work in parallel due to their shared ownership in each other. I recommend the Soul over the Santa Fe because of the level of value it gives you. Also, with the Soul space is more efficiently used (the problem with SUVs) and it has a smaller footprint. The Santa Fe will be the more comfortable car. If you buy CPO, you'll get a long warranty, but the purchase price will be higher. Kia and Hyundai both have low resale values, so they make for very good used cars. The Soul doesn't have AWD. 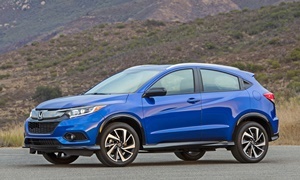 Another suggestion could be the Honda HR-V, which uses space very efficiently (based on the Honda Fit). It is available with AWD and comes with a reliable (though weak) engine. You can get a manual or CVT. It comes with a lot of features standard. 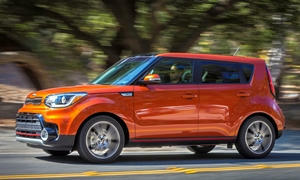 Honda resale value is extremely good, so the Kia may be the better deal. 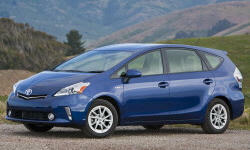 The Prius v is also worth a look. They get over 40 MPG and are super reliable and cheap to maintain (except the battery at around 200k miles $2000). It has a lot of cargo space. They aren't as fun as the Soul, but more fun than getting 18 MPG in the Santa Fe. It uses less than half the gas. It is not available with AWD. Good luck in your car search and please update us! Thank you everyone for your responses. It's so great to be able to learn from each of you. I will take a look at the Tuscon as well. Where I live, the used Soul and Santa Fe sell for about the same price, which was why I was considering them. I also took a look at the Toyota Yaris and Nissan Versa online, but think that their 1.6L engines may be under what I need for mountain trips in the summer. Snow is a factor here, but generally highway during the day, and rarely during a snowstorm, so FWD should be ok, though I do love the AWD of my Mitsubishi. The service manager at the Mitsu dealership told me the newer models aren't as reliable as my old girl, which is why I have chosen not to return to them. I plan on heading out to test drive this afternoon, so it will be great to go knowing that I've had some good input from each of you. Dan, I will give Gracie and Nelson a pat from you! Thanks for the update Maureen. It would be great to hear how your decision process ends!